Archaeologists use aerial photographs to spot archaeological sites from above. They show archaeological sites as cropmarks and earthworks. 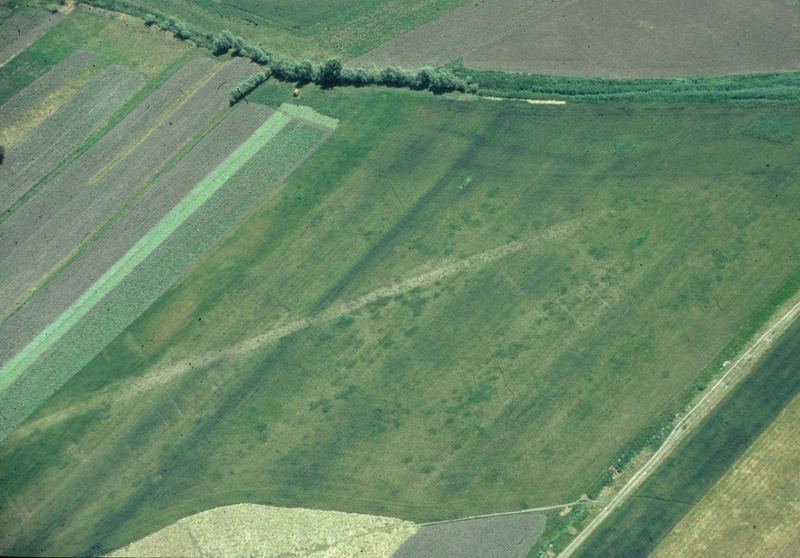 Cropmarks occur where there are archaeological features, such as walls and ditches, underneath where a crop is growing. For example, greener healthier crops grow above ditches where there is more soil depth. The result is a plan (or birds-eye) view of the layout of features across a site. Earthworks are banks, ditches and mounds of earth and stone. They cast shadows, which can show up in aerial photos. Aerial photos are particularly useful because they often show more of an archaeological landscape than is visible from the ground. The alum industry has been described as “the first chemical industry”. Alum is a chemical made up of aluminium sulphate with either ammonia or potassium sulphate. It was used for a number of things such as fixing dyes to clothes, tanning leather, and in Roman times it was used for purifying water. Prior to Henry VIIIs break with Rome, alum was mostly imported from Italy, with the Vatican controlling most of the world supply; this supply was stopped after the Reformation. With wool being the principal industry in Britain, another source of alum had to be found; most of the production of alum took place in Yorkshire, both on coastal sites and further inland. There are examples in Dorset and in Lancashire. The alum process was a long one; firstly shale had to be extracted from quarries and burned to separate the alum from the quarried shale. This burning could take months and sometimes up to a year to complete. The burnt shales would then be leached in large tanks of water to create a liquid called aluminium sulphate. This would take place in several stages, through a series of tanks which would remove impurities and concentrate the liquid aluminium sulphate further. It was then transported to an alum house where it was boiled over a coal fire. To create the alum crystals a source of potassium (such as potash or burnt seaweed), or a source of ammonia (such as urine) was mixed with the aluminium sulphate. It was then left to cool. The last alum works were closed in 1871. Many were located at the coast because it provided easy access to quarrying shales from cliff edges, as well as easy transportation for resources such as coal, seaweed, potash and urine. Many remains such as alum houses and sluicing tanks can still be seen, as well as jetties and wooden staithes which would have been used by boats associated with the industry.